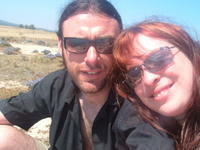 We’ve been expats for about eleven years now, working as English teachers in various countries. Along the way we’ve met lots of other expats doing all kinds of jobs, so for this series, we’re going to tell their stories. While we love teaching abroad, some people do it for a while and then change to do something different. Emily has done just that and now has an incredible job – she’s working as a safari guide in South Africa! You know we love wildlife, being ex-biologists, so this story is fascinating for us. To tell you the truth, we’re a bit jealous! You can read more of her stories on her blog Safari Guide Diaries. When I was just a child I had a dream of moving to Africa to be a game ranger. As a young British girl, most people just assumed it was a phase. Others dismissed the idea as ridiculous and asked me what my ‘real job’ would be. Eventually, sadly, the pessimists of the world took hold and I gave up my dream and became a science teacher instead. Don’t get me wrong – I loved teaching – but it wasn’t my passion. After a year working in a difficult school in the UK, I decided that I needed a change. I cashed in my meagre possessions and bought a round-the-world ticket for a whole year. That was back in 2012 and, over 6 years later, I’ve never really been back. I travelled around the world, living and working as a teacher in all sorts of places; from Spain to Dubai and even Australia. I changed as a person in many ways but one thing never did – that childhood dream to move to Africa. Having amassed new savings from my work, it dawned on me that I might be able to afford it after all. Doing the math, I worked out that if I saved as much as I could for another 18 months, I would be able to pay for my dream course – the one-year Professional Field Guide course, to learnt to be a safari guide in South Africa. So, that’s what I did. 18 months later, on July 29th 2017 I got on a plane to South Africa to make my childhood dreams come true! The rest, as they say, is history. I spent 5 months at safari school living in a tent and learning everything I could about the bush. From animals and their behaviour to the trees, grasses and rocks. There were copious theoretical and practical exams to pass, including an advanced rifle handling exam that requires you to fire a bullet into a 5cm circle (representing the brain) of a simulated charging lion! Not having had much experience with guns – this was definitely my biggest challenge so I was over the moon that I managed to pass! As a teacher, it was very strange to be on the ‘student’ end of things again. But I loved every minute. At the end of 2017, I had passed all of my guiding exams and began my internship in a real safari lodge in the Kruger National Park. There, I learnt about life in a lodge environment – a hands-on look at what a guide really does on a day-to-day basis. It was tough at times, but an invaluable experience which ultimately gave me the skills and knowledge to finally get a job as a real-life safari guide. In May this year, a little before the end of my course, I started working as a safari guide in a small boutique lodge in the Klaserie Nature Reserve – a privately owned reserve in the Greater Kruger. I’ve been there almost 2 months now and already have had some of the most incredible experiences that make the lifelong struggle to get here worth every second. From having a huge male elephant look me right in the eye, just an arm’s length from my face, to spending hours quietly watching my now favourite leopard, Saseka, I can’t get enough. That being said, the very best thing about my new life as a safari guide in South Africa is that I get to see highly endangered wild dogs. My favourite animal, it took me a decade of holidays and trips to Africa to finally get to see them properly in the wild. As beautiful as they are ruthless hunters, these beguiling and sociable creatures captured my heart. In one amazing sighting, I actually managed to find the wild dogs just as they were heading out to hunt. Following them closely, they suddenly caught sight of a lone impala ram and made chase. Not used to driving off-road (my internship didn’t allow it) I struggled to keep up and lost them in the bush. But not wanting to admit defeat, I drove all the roads in the area looking and listening for sign of them until, finally, I relocated them at the dam. Incredibly, the dogs had chased the Impala into the water and, seeing an opportunity, the Impala had swum all the way to the island in the middle. The hungry dogs looked on longingly, refusing to enter the water and risk the wrath of the hippos and crocodile within. Pacing the shoreline, they eventually realised their quarry was lost and moved on to find a new victim. Having enjoyed their company for most of the morning, I decided to leave them to it – after all, I’m sure I’ll be seeing them again soon! In the end, it has taken me half a lifetime to achieve my dream job in the African bush. It was incredibly hard at times and I definitely lost faith more than once. But I’m grateful every day that I never gave up. Being a safari guide in South Africa means long hours and very little pay. Gone are my nice, fat teacher pay cheques from Dubai and getting to go out for drinks with my friends at the weekend. There will be no more spontaneous trips abroad in the near future. Even the wifi is pretty rubbish! But, at the end of it all, I wouldn’t change a thing. Read more stories of people teaching abroad in our New Teacher Tales Series. If you’re an expat and would like to tell your story of how you started out, let us know. Why not pin this to your expat or South Africa Pinterest board for later? Wow I am wondering if you work for my friends who own Klaserie River Safari Lodge? That would be amazing! I grew up between the UK and South Africa and it’s wonderful to read your story – so glad you have achieved your dream! I am also a teacher and have worked all over the world including Botswana, Canada, Switzerland and others! I am working in Australia now – where did you work when you were in Oz? Hope you continue to enjoy your work in Africa for many years – all those fantastic animals!